(Bloomberg) -- Ivory Coast said it opened a tender to secure 500 billion CFA francs ($865 million) in commercial loans from offshore lenders as the West African nation seeks cheaper options than selling international bonds to finance its budget. 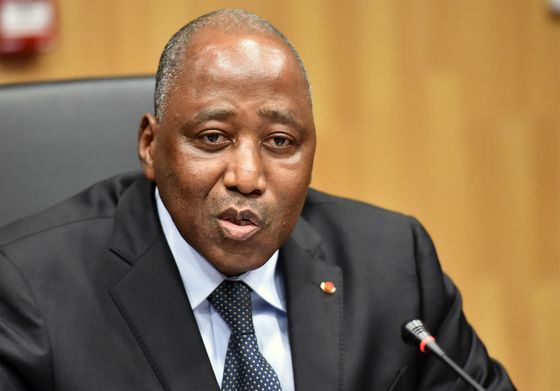 In addition to the loans, the country will issue 900 billion francs in debt securities on the regional market to meet its finance needs of 1.4 trillion francs for the year, Prime Minister Amadou Gon Coulibaly told reporters Thursday in the commercial capital, Abidjan. Ivory Coast may still issue Eurobonds to refinance more expensive debt, he said. The world’s top cocoa producer has mostly used the Eurobond markets for its external funding in recent years. Neighboring Nigeria has indicated a preference for concessional loans for 2019, while Ghana and Benin sold more than $3.5 billion in debt earlier this week for its finance needs. Ivory Coast may issue 150 billion francs of international bonds in the euro-pegged domestic currency this year, or in 2020. Gross domestic product expanded by 7.4 percent in 2018, against an estimate of 7.7 percent. The government targets a budget deficit of 3 percent of GDP in 2019, from 4 percent of GDP last year.